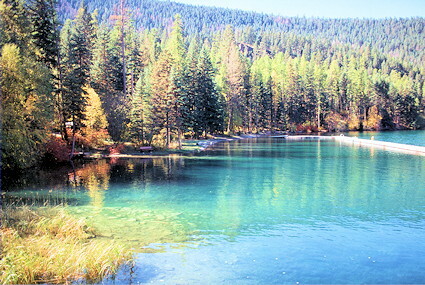 Premier Lake Provincial Park is situated 72 km north of Cranbrook, nestled against the west slopes of the Rocky Mountains, and is one of the key recreational fishing lakes in the East Kootenays. The park is 662 hectares and encompasses a total of five lakes, all of which are renowned for their rainbow and eastern brook trout fishing. The emerald green lakes of Premier and four smaller lakes, Canuck, Yankee, Cats Eye and Quartz offer a unique and varied fishing experience in a secluded and pleasant park atmosphere. Located east of Skookumchuk at the northern end of Premier Ridge in the Hughes Range of the Rockies, the park provides the visitor with a campground, play area, boat launch, excellent beaches and hiking trails where the visitor may encounter Rocky Mountain big horn sheep, elk, whitetail and mule deer. The campground contains 57 vehicle/tent camp sites and is located at the south end of the lake. There are no drive-through sites. The area is rich in wildlife. Premier Ridge, west of the lake, is an important wintering range for elk, whitetail and mule deer, and Rocky Mountain bighorn sheep. Forests of Douglas fir and western larch are common in the park. Osprey, eagle, heron, king fisher, numerous forest birds and water fowl can also be seen.